Synergy™ LX Multi-Mode Microplate Reader economically automates many common microplate assays. The high quality optical design ensures excellent data in absorbance, fluorescence and luminescence detection modes. Absorbance optics include a xenon flash lamp and monochromator for continuous wavelength selection from the low UV through the visible range to 999 nm. Fluorescence and luminescence measurements are made with filter- based optics for optimal specificity and direct detection to prevent light loss resulting in outstanding accuracy.The broad wavelength ranges enable many common assays including nucleic acid and protein quantification, ELISA, BCA, Bradford and cell viability. 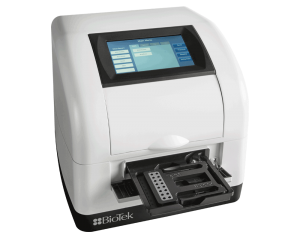 Easily accessible filter cubes make running different assays quick and effortless, while the touchscreen user interface simplifies programming. Immediate data display, plus output to a USB flash drive, printer or Gen5™ Software makes the Synergy LX a versatile assay workstation. An upgradable design allows a lab to buy what is needed today and add other detection modes in the future. Enables many common end point assays including nucleic acid and protein quantification, ELISA, BCA and Bradford assay, and cell viability assays. SLXA Synergy LX with monochromator-based absorbance from 200 nm to 999 nm. SLXF Synergy LX with filter-based top fluorescence and luminescence. SLXFA Synergy LX with monochromator-based absorbance from 200 nm to 999 nm, filter-based top fluorescence and luminescence. SLXATS Synergy LX with monochromator-absorbance from 200 nm to 999 nm and touchscreen interface. 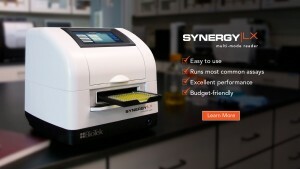 SLXFTS Synergy LX with filter-based top fluorescence and luminescence, and touchscreen interface. SLXFATS Synergy LX with monochromator-based absorbance from 200 nm to 999 nm, filter-based top fluorescence and luminescence, and touchscreen interface. Note: All Synergy LX configurations include linear, orbital and double-orbital shaking. Power: External 24VDC power supply compatible with 100-240 volts AC @50-60Hz. 60W maximum consumption.